Posted on 24, March 2016 by EuropaWire PR Editors | This entry was posted in Defence, Italy, Transportation & Logistics and tagged Aermacchi M-346 advanced training aircraft, Finmeccanica, Italian Air Force, Mauro Moretti. Bookmark the permalink. 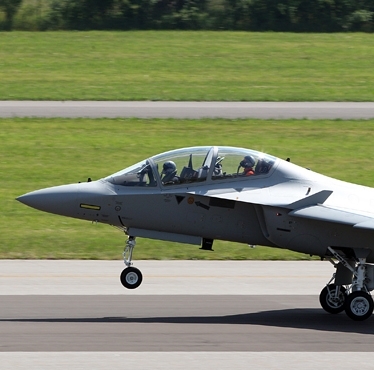 ROME, 24-Mar-2016 — /EuropaWire/ — Finmeccanica signed a contract worth over 300 million Euros withARMAEREO (Italian National Armaments Directorate) of the Italian Defence Ministry for a further nine Aermacchi M-346 advanced training aircraft for the Italian Air Force. The contract was signed by Grazia Nunnari, head of national and international contracts of ARMAEREO (Italian National Armaments Directorate) and Filippo Bagnato, Managing Director ofFinmeccanica’s Aircraft Division, in the presence of Chief Inspector General Francesco Langella, Director of Armaereo and the Chief of Staff of the Italian Air Force, Lieutenant General Pasquale Preziosa. With this new contract, the number of Aermacchi M-346 aircraft ordered by Italy (identified by the country’s armed forces as the T-346A) rises to 18. Delivery of the new aircraft will begin this year and will be completed by 2018. The contract also includes logistics support and an additional development phase of the advanced integrated training systems that has the aircraft at its core and which also includes digital training aids, simulators and infrastructure at the Lecce-Galatina Air Force base. A total of 68 Aermacchi M-346 aircraft have now been ordered, by Italy (18), Israel (30), Singapore (12) and Poland (8). Following the process of the reorganisation of the Finmeccanica Group’s companies, it should be noted that from January 1st 2016: the “Helicopter Division” has absorbed the activities of AgustaWestland; the “Aircraft Division” has absorbed part of the activities of Alenia Aermacchi; the “Aero-structures Division” has absorbed part of the activities of Alenia Aermacchi; the “Airborne & Space Systems Division” has absorbed part of the activities of Selex ES; the “Land & Naval Defence Electronics Division” has absorbed part of the activities of Selex ES; the “Security & Information Systems Division” has absorbed part of the activities of Selex ES; the “Defence Systems Division” has absorbed the activities of OTO Melara and WASS. Finmeccanica is among the top ten global players in Aerospace, Defence and Security and Italy’s main industrial company. As a single entity from January 2016, organised into business Divisions (Helicopters; Aircraft; Aero-structures; Airborne & Space Systems; Land & Naval Defence Electronics; Defence Systems; Security & Information Systems), Finmeccanica operates in the most competitive international markets by leveraging its areas of technology and product leadership. Listed on the Milan Stock Exchange (FNC IM; SIFI.MI), at 31 December 2014, Finmeccanica recorded restated consolidated revenues of 12.8 billion Euros and has a significant industrial presence in Italy, the UK and the U.S. The Aermacchi M-346 is a twin-engine, two-seater aircraft, considered the most advanced trainer aircraft for military pilots available on the market today. Thanks to innovative technical features and the latest design criteria, the Aermacchi M-346 is defined by low acquisition and operational costs. The Aermacchi M-346 is the core element of the ITS (Integrated Training System), the advanced integrated training system created and developed to deliver advanced training of Air Force pilots destined to fly tactical aircraft. The performance of the aircraft, the reduced number of maintenance hours, advanced avionics and a flight simulation system make the Aermacchi M-346 the best solution in terms of cost-effectiveness, reliability and optimisation of the training path of student pilots. Operated at the 61° Stormo of the Italian Air Force in Galatina (Lecce) it allows pilots to acquire the essential flying skills needed to operate modern fourth and fifth-generation aircraft. Many foreign countries are currently training instructors and students at the internationally recognized Italian Air Force base in Lecce. The Aermacchi M-346 is equipped with a digital avionics system which fully represents the latest generation fighters including: Eurofighter, Gripen, Rafale, F-16, F-18, F-15, F-22 and F-35 and can be used in all advanced and pre-operating training phases, thereby notably reducing the training hours carried out on the most expensive leading aircraft.